Pop up to the second floor to see all the memorabilia in it's shiny glory. Each case features a different saga of the Zelda franchise (from hyping the upcoming Skyward Sword all the way back to the series' modest beginnings). 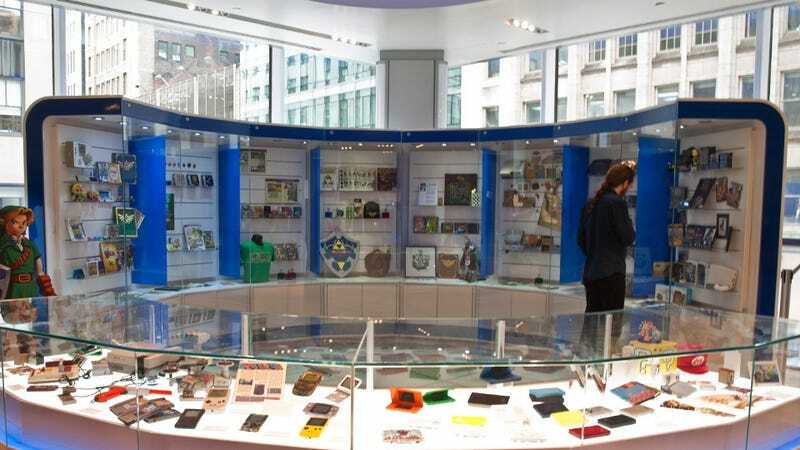 The folks at Nintendo World told me that the display will be around till February of 2012, so if you're in the New York area, be sure to pop over and have a look. Zelda's Gamecube and Wii history. There are many CDs containing original soundtracks. Many of them imports all the way from Japan. Limited Edition statue of Link (they also have one with Link in his blue Zora Tunic). More soundtracks, an Ocarina, and two of the many charming bottles they have on display. I loved those bottles, simple yet effective. Classic Zelda in all it's glory. The Adventure of Link and some retro merchandise (that tote bag is fantastic). The framed fabric print is gorgeous. A Tri-Force jewel nestled in between a biography of Zelda's creator, Shigeru Miyamoto and a piece of art. A Zelda'fied Gameboy Advance SP, signed by Miyamoto. A print in the Gameboy cabinet featuring art from Link's Minish Cap adventure. DS bundles and Link merch.